Update 26/4: The feedback should really be calculated by the ratio DT1/DT2 = 1-g0F. Applying this for the full period of CRUTEM4 data 1900-2005 the value derived for F= -1.5+/- 0.8 Wm-2K-1. I have been studying differences in climate data between those areas of the world with very low atmospheric water vapour (Deserts and Polar regions) and those areas with very high water vapour content (Tropical Wet regions). The data set consists of all 5500 station data corresponding to CRUTEM4 kindly provided by the UK Met office. Each station has then been classified by climatology using it’s geographic location and a lat,lon grid based on the Köppen-Geiger climate classification . We define ARID stations as all those situated in Deserts or Polar regions i.e. those in areas with precipitation ‘W’ or climate ‘E’ in . These areas have the lowest atmospheric water content on Earth. The WET stations instead are defined as those within Tropical fully humid areas – ‘Af” in . These include tropical rain-forests and have the highest atmospheric water vapour content on Earth. In a previous post I already showed that the temperature anomalies in the Sahara rose faster than a similar area in S. Asia, so I wanted to extend this study globally using the latest CRUTEM4 data. I therefore calculated the global anomalies for both sets of stations ARID and WET using the same algorithm as used for CRUTEM4. The results are shown in Figure 1. 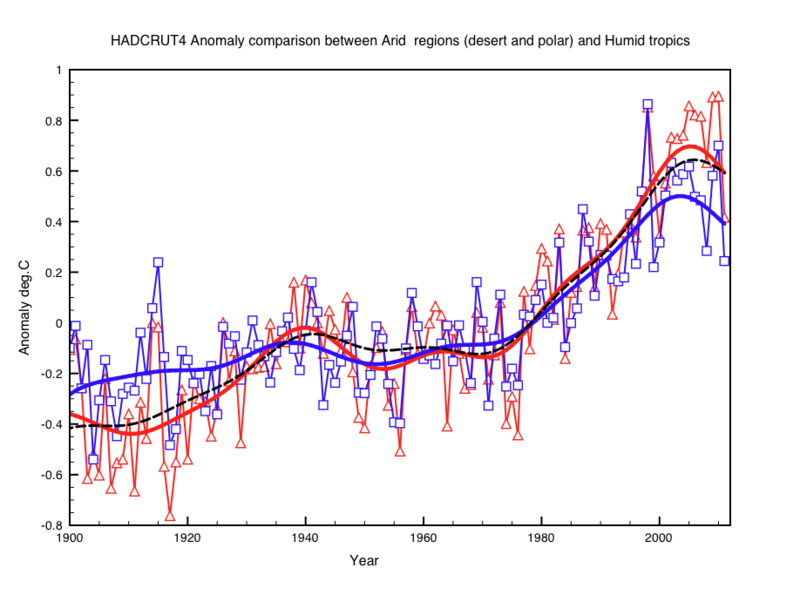 Fig 1: Temperature anomalies for ARID stations in red and WET stations in blue. The smooth curves are FFT smoothed curves. The black dashed curve is an FFT smooth to the full CRUTEM4 temperature anomalies. We will assume that there are external forcings on the climate both anthropogenic and natural which are reflected in temperature anomalies. If we label the forcing DS and the consequent change in temperature anomaly as DT. Average Feedback parameter = -0.5 (+- 0.1)*g0 which taking G0 = the Stefan-Boltzman value 4*sigma*T^3 = 3.75W/m2K-1. Remarkably this is the same value as that derived from a simple argument regarding the Faint Sun paradox see here. It has been pointed out by Richard Lindzen  that much of the Earth’s heat is transported bodily through evaporation and convection to the upper atmosphere where IR opacity is low and can then escape to space. Therefore water feedback effects depend on the water vapor content of the upper atmosphere more than that at the surface. Increased evaporation, convection and rain out could even dry out the upper atmosphere. This could be a possible mechanism for negative feedbacks. Such effects would be much smaller in ARID areas with little or no evaporation. 2. Richard Lindzen, Some uncertainties with respect to water vapor’s role in climate sensitivity. Proceedings NASA workshop on the role of Water Vapor in Climate Processes. This entry was posted in AGW, Climate Change, climate science, Science and tagged CO2, Feedback, HadCru. Bookmark the permalink. Interesting study… This corresponds well with why the models fail and grossly over predict warming by using positive feedback. I should mention that there is a grammatical error. It would also seem that the negative feedback produced by the water cycle would respond to increases in temperature by ramping up in speed until the temperature had dropped, just as any good heat engine would behave. Arid areas will certainly cool faster due to reduced greenhouse effect, and heat faster due to reduced cloudiness. The outgoing radiation can be seen by looking at satellite images in the water vapor bands, at the Unisys site for example. The dark areas in arid regions are basically escaping heat. You can compare rates of outgoing radiation in different climate zones with the modtran program. I wouldn’t draw any conclusions about sensitivity from this, as the main actors are water vapor and clouds, of which, sadly, there seems to be little ‘official’ knowledge. My own opinion is that water vapor/clouds act as a powerful stabilizing mechanism, acting to counter any external forcing and the fact that you see this arid/moist difference in your analysis supports this. Neverless, the Svensmark mechanism may change the equilibrium by drying out or moistening the atmosphere, thus reducing or enhancing the greenhouse effect. I think Lindzen has the right idea about convection as an important part of the heat removal mechanism, and about water vapor/clouds as an important feedback. I hope you will continue your very interesting work.